Image source: Suburban Propane Partners. Suburban Propane Partners (NYSE:SPH) sells propane, an often forgotten but vital fuel. Sounds simple, but it's a lot more complicated than you might think. For example, the price of oil is the key to an oil company's top and bottom line, but the price of propane isn't really so important to Suburban. 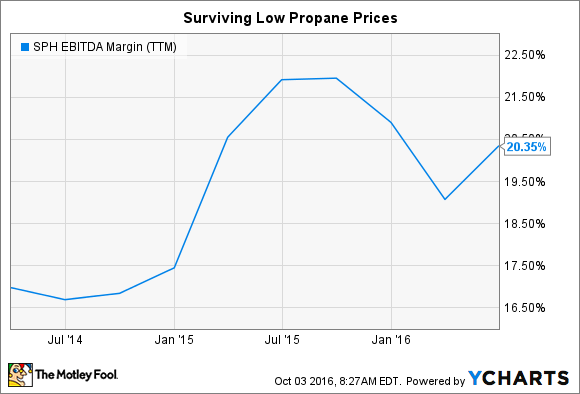 Here are four charts that will help explain Suburban Propane Partners in a way that words alone can't describe. The first thing to understand about Suburban Propane Partners is that roughly 90% of its business is tied directly to propane. The rest of the business comes from selling oil, gas, electricity, and services. So, clearly, propane is the driving force behind Suburban's business. That said, the company's business is spread fairly well across the country, though the Northeast is by far the largest region of operation. And there's a fair amount of diversification in the company's customer base, too, with home heating being the biggest piece at around 50%. The other half of the business comes from commercial, industrial, agricultural, and other uses. The big takeaway here is that bad results in one area of the country won't completely derail the company. However, if the heating season is weak, well, results will feel the impact. The next big thing to understand about Suburban Propane is that its business is highly seasonal. Sure, propane gets used year-round in some applications, but the biggest use of propane by far is for heating. Just take a look at the graph below. SPH Revenue (Quarterly) data by YCharts. The partnership's quarterly revenue looks almost like a heartbeat. Why? Because you only heat your house when it's cold. That means that the winter season is when Suburban makes the vast majority of its money. That's something you'll want to keep in mind as you read the quarterly results. Suburban Propane is just a middle man that gets paid for delivering propane. It basically passes the cost of the fuel on to its customers. That's a big part of the Suburban Propane puzzle that investors need to understand. For example, the price for propane in fiscal 2015 fell just over 50% year over year. And that led to a big decline on the company's top line, since the cost of fuel is included in that number. However, since the company really makes its money from delivery charges, the impact on the bottom line was very different from what you might expect. Net income per unit in 2015 was only off about 11%. That's a much nicer picture. SPH EBITDA Margin (TTM) data by YCharts. In fact, as you can see from the chart above, Suburban Propane's EBITDA margins held up fairly well despite the fact that its top line was getting hit by falling propane prices. So, if you are looking at Suburban, you need to look past the seasonality and the price of propane to get a clearer picture of what's going on. The drop in 2015 on the bottom line, in case you were wondering, was driven by warm weather that reduced deliveries. Which brings up the next chart: distributions. Suburban Propane is a limited partnership, which means it's designed to pass tax-advantaged income on to unit holders. With a distribution yield over 10%, it's clearly doing that today. However, there's more to this story. Not only is the yield high today, but Suburban has a solid history of increasing its disbursement. Although it doesn't happen every year, the clear trend is positive. That's supported by Suburban's fairly consistent core business and the fact that it is a consolidator in the propane space, allowing it to charge more customers for propane delivery over time. Keep in mind, however, that because of the seasonal nature of the business, you'll want to look at distribution coverage on an annual or trailing-12-month basis. Simply put, Suburban won't cover the payment during the warm months; it's the cold months, when it delivers more propane, that allow it to pay the full distribution. If you looked at Suburban Propane and thought it was just like every other company that's focused almost entirely on energy, you'd miss some key aspects of the business. The biggest being that it really makes money for delivering propane, not on the propane itself. 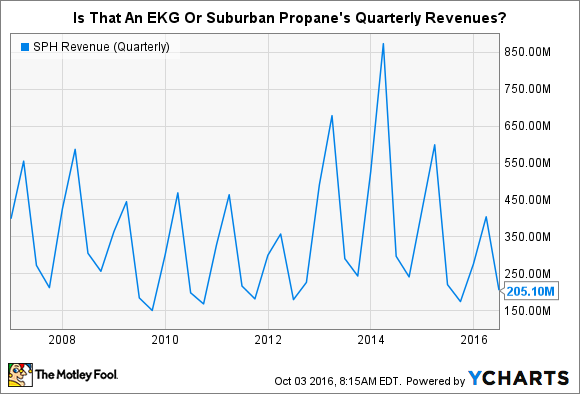 There's also the seasonality issue: Since propane's biggest use is for heating, that can make it hard to get a read on Suburban's business if you aren't aware of what's going on. And, of course, the big draw here is the steadily growing distribution. But if you don't understand the other aspects of the business, you might not stick around to benefit from what is, at its core, a pretty consistent -- perhaps even boring -- business throwing off a regular stream of cash to its unit holders.